Restoring and enforcing Glass-Steagall banking system regulation empties the Wall Street casino; the President and Congress must then create a large-scale national credit institution to replace speculation with productive employment and productivity. To not merely “rebuild” America’s obsolete economic infrastructure but to create a new, more productive infrastructure at the frontiers of technology, will require $5 trillion or more in national investments; Ding Xuedong, the head of China’s sovereign wealth fund CIC recently estimated $8 trillion was required, and offered to invest CIC’s U.S. Treasury holdings in it. The need for the U.S. to be able to create a large amount of national economic credit, rapidly, to mobilize the American economy and raise its productivity, is not simply a matter of “renewing the nation’s infrastructure,” but also one of maintaining credit for innovative manufacturing—including by small and medium-sized companies—through a large national system of commercial banks. For 150 years, when such mobilization of national credit was done successfully—from the time of Washington to that of FDR—the method of doing it was Treasury Secretary Alexander Hamilton’s. 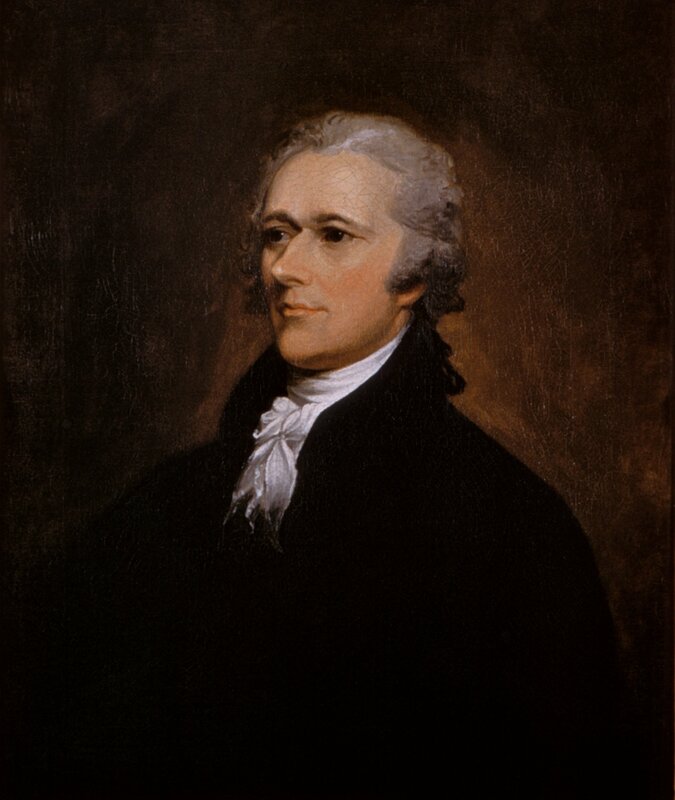 Alexander Hamilton, U.S. Treasury Secretary during George Washington’s Presidency, created a system that closely coordinated the relationship of public credit with the intention of national government to follow through on the actions for which the credit is emitted. The more the nation’s government is committed to see through the creation of credit, and has the necessary powers of finance, trade regulation, and taxation, the better certainty there is on that credit, and the more is credit between parties able to serve as a currency and means of payment. The task is to create and circulate new currency which is sound in the immediate term, and to invest it in the broad national purposes of developing the productivity of the American economy and labor force, so that it will be much more than repaid in the medium and long term. Any and all national currency, is national debt. During the period of rapid U.S. economic and population growth stimulated by Hamilton’s First Bank of the United States and the Monroe-Quincy Adams Second Bank of the United States, the Hamiltonian representatives of the “American System” held that the Treasury should create, issue and regulate circulation of new currency exclusively through a National Bank. The National Bank, as a commercial bank and issuer of the currency, would make sure the new currency issued was immediately sound and based on funded debt of the Federal government. And if the Bank were led on Hamiltonian principles, it would also make sure that the use of that new currency fostered the future greatness of the United States, and multiplied itself in value in the process. The First and Second Banks of the United States were extraordinarily successful in directing new credit to waves of new infrastructure—roads and ports, then long-range canals, then railroads, iron and coal works and steam projects, etc.—and also to the rapid growth of innovative manufacturing in America. When, under Abraham Lincoln, the U.S. Treasury, for the first time, itself created a new paper currency—the Greenbacks—its issuance was still based, not this time on a Third Bank of the United States, but on a new national banking system, of newly Federally chartered commercial banks. These Treasury-chartered banks bought new Treasury bonds being issued by the government, and received Greenbacks in equivalent amounts to circulate. The new Treasury debt was of 20 years maturity; the interest had to be made sound by new taxes, and was. The nationally chartered commercial banks, holding Federal debt as their reserves at the Treasury, were the points from which the new Greenback currency was issued, was circulated, and to which it came back to pay taxes. Considered collectively in cooperation with the Treasury, those newly chartered commercial banks functioned, effectively, as a Third Bank of the United States. This Greenback credit issuance funded not only the huge military and industrial effort of the Union in the Civil War, but the development of trans-Continental railroads, steel and iron industries, state colleges and agricultural extension services, and propelled the United States to the world’s leading industrial power by the early 20th Century. And the Greenbacks remained throughout a sound currency, fully backed by interest-bearing Federal debt backed in turn by taxes. So sound—made so by growing productivity and real wealth—that when the 20-year Greenback bonds became mature for redemption, in gold and silver no less, nearly all holders of Greenbacks elected to keep the paper currency and pass up the precious metal specie. Franklin D. Roosevelt, basing himself on certain actions of Congress in 1933, attempted in 1934 to create a “national industrial bank” with 12 branches, within the Federal Reserve System. In FDR’s proposed March 1934 legislation, this national industrial bank within the Fed would absorb a total of $6 billion in Treasury securities, and then be able to issue an equivalent amount in Treasury Notes (Greenbacks) directly as loans to industrial companies struggling to revive production. Franklin Roosevelt’s ancestor Isaac Roosevelt, still famous in the family in FDR’s time, had been Alexander Hamilton’s partner in the Bank of New York; and FDR himself had written a thesis on Hamilton’s economics while at Harvard. Congress did not adopt this legislation of FDR’s, leaving him to rely on Hamiltonian “approximations” in the Reconstruction Finance Corporation, Tennessee Valley Authority, Works Progress Administration. This was, again, successful in reviving economic growth, productive employment and productivity, and defeating fascism. Still today, the structural arrangement of the Federal Reserve Bank is that chartered commercial banks are required to buy Treasury securities and place them on reserve at the Federal Reserve, which issues U.S. paper currency on that basis. But the Federal Reserve’s policy is not to issue currency for purposes of production, employment, and productivity. Rather it issues currency only to maintain the reserves of the large U.S.- and Europe-based banks, and to make liquidity loans to those banks when they fall into crisis. The deeper the banking crisis, the higher the Federal Reserve builds up the excess reserves of those large banks by printing currency, some $4 trillion-plus in the past eight years. The Federal Reserve has been directly challenged in Congressional hearings on its failure even to buy infrastructure bonds issued by cities and states since the 2008 bank panic. Yet despite leveraging its own Treasury-bond capital1The Fed’s capital, from the Treasury and nationally chartered banks, is about $55 billion, while its asset book is about $4.5 trillion. nearly 100-to-1 in creating vast waves of new U.S. currency since 2009 (by buying Treasury and mortgage securities from the megabanks), it has persisted in issuing that currency only to build huge excess reserves in large banks, by loans and by outright purchase of their assets. There has been no net issuance from all that new currency into the productive economy. In fact, for much of the past eight years the net issuance into the real economy has been negative. The biggest U.S.-and Europe-based banks are, effectively, the Federal Reserve’s only customers. It does not perform any of the functions of commercial banking, as did the First and Second Banks of the United States and Lincoln’s “Third” National Bank System of the United States. Ideally much of this large volume of new Treasury debt would be absorbed by commercial banks, which would also be circulating the new “Greenbacks” to contractors, universities and engineering companies and many others. But the commercial banks already have very substantial Treasury holdings. 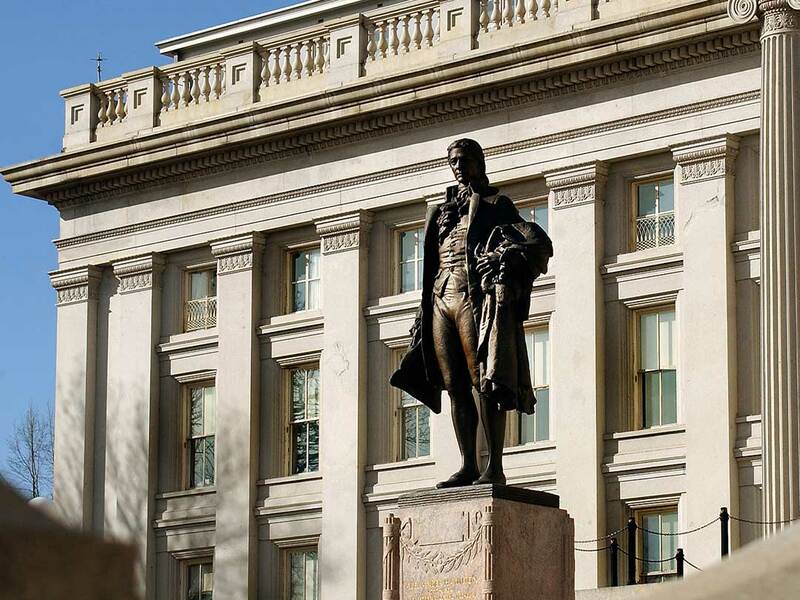 Large foreign government holdings of U.S. Treasuries have been being reduced in recent years. Minimally, interest rates on Treasury debt would rise very fast indeed. Congress can instead take the action a Treasury Secretary Hamilton would have proposed to them now. 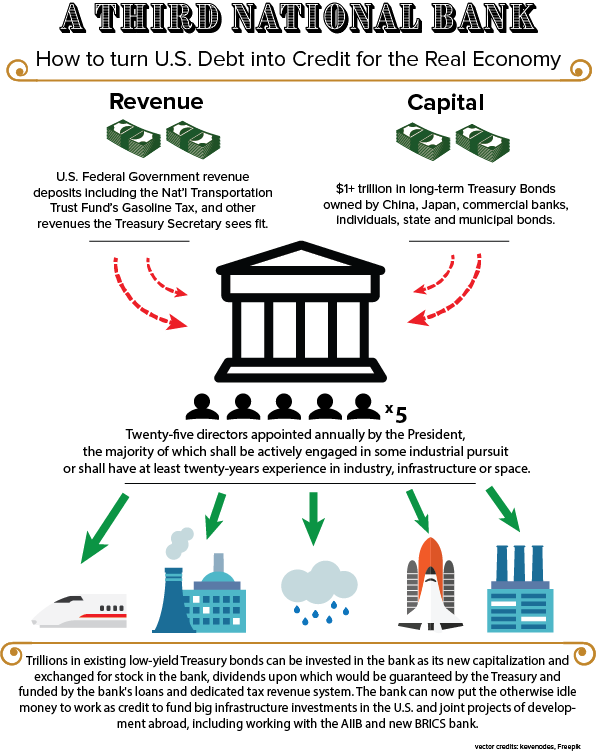 It can create a Bank of the United States for Infrastructure and Manufacturing, which is structured so that holders of existing, longer-term Treasury debt will transfer their holdings into this Bank in exchange for its preferred stock for 20-25 years, to earn a dividend significantly higher than Treasury long-term rates and guaranteed by the Treasury. A tax such as, for example, an adjusted Federal gasoline tax (Trust Fund) can be assigned to the payment of the Bank’s dividend; the Bank’s purposes would then include those transportation requirements of the SAFETEA-LU acts to which the Federal gasoline tax is now dedicated. There are several other user taxes legislated for infrastructure (i.e., ports), proceeds of which are instead used as general revenue by Congress. They can also be dedicated to the bank. The Bank’s initial aim should be a capital in the range of $1 trillion. The largest holders of long-term U.S. Treasury debt, such as the government institutions of China and Japan, have every interest in investing some of that debt into a Bank of the United States for Infrastructure and Manufacturing, as well as American commercial banks, funds, and citizens. By the Bank thus absorbing, as its capital, even a minor but significant portion of outstanding U.S. Treasury debt, it will then be in a position to be the point of issuance for new currency, an equivalent amount of Treasury Notes—“Greenbacks.” These Greenbacks can be issued by the Treasury to the Bank for circulation, up to the amount of the Bank’s capital. More important than this structure are the national purposes of economic, technological and scientific progress to which this national credit institution is put. This will also determine the long-term “payback” of such a Bank’s investments by the accelerating growth of productivity of the economy and the American labor force. These purposes bring us to the standards of productivity by which the physical returns on investments can be assessed. EIR's Paul Gallagher discusses the fundamentals of the National Banking approach past and present.